Steph Brown is back! 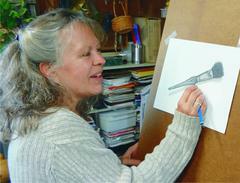 Beginners and Intermediates will benefit from her drawing instruction. Wednesday night drawing starts this week! Sign up for four weekly classes – $75 Call Gloucester Arts On Main at 804-824-9464 – come to class tomorrow night – bring your drawing supplies (pencils, erasers, paper).